The collection from which the exhibition is drawn, put together by David and Nan Skier, is the largest in the world and contains more than 100 objects, both decorative and functional, from simple lockets to lavish rings, each of which features an eye miniature. Although the majority of the works were meant to be worn as jewelry, some were intended to be carried in the form of small boxes. 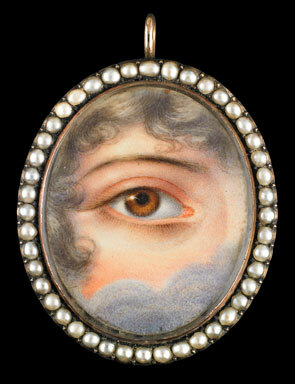 The Georgia Museum of Art at the University of Georgia is presenting the exhibition “The Look of Love: Eye Miniatures from the Skier Collection” from Oct. 6, 2012, to Jan. 6, 2013. Organized by the Birmingham Museum of Art, this show is the first major exhibition on the little-known subject of lover’s eye jewelry and makes use of an iPad app to enhance visitors’ experience of the works of art. This exhibition looks at the exquisite craftsmanship of small-scale portraits of individual eyes set into various forms of jewelry from late-18th- and early-19th-century England. In addition to the skilled artistry with which each of these tiny portraits was painted are enchanting stories of secret romance and love lost. In 1784, the Prince of Wales (later George IV) secretly proposed to a Catholic commoner and widow named Mrs. Maria Fitzherbert. Because it was highly unlikely that his father, King George III, would agree to the marriage, Mrs. Fitzherbert initially rejected the prince’s proposal and fled to the Continent. Despite their year-long separation, the prince proposed a second time, sending Mrs. Fitzherbert a picture of his own eye in place of an engagement ring. The prince’s romantic gesture inspired an aristocratic trend for exchanging eye portraits in a wide variety of settings including brooches, lockets, rings and toothpick cases. Because the eye might only be recognized by persons of the most intimate familiarity, these customized tokens were largely commissioned by clandestine lovers, whose relationships were viewed as illicit or subject to misunderstanding. “Visitors can marvel at the virtuosity of miniature painting and get a rare glimpse of private life in a different period of time,” said Dale Couch, curator of decorative arts at GMOA and the in-house curator for the exhibition. The exhibition is accompanied by an iPad app created by the Birmingham Museum of Art. Visitors to GMOA will be able to check out an iPad for free to use the app while visiting the exhibition. Because these works are so small and are exhibited in cases, the app magnifies them and allows the viewer to see them from multiple angles in videos. It also provides insight on each work with informative text. The collection from which the exhibition is drawn, put together by David and Nan Skier, is the largest in the world and contains more than 100 objects, both decorative and functional, from simple lockets to lavish rings, each of which features an eye miniature. Although the majority of the works were meant to be worn as jewelry, some were intended to be carried in the form of small boxes. Many of the painted miniatures in the exhibition were created to memorialize and mourn a loved one who passed away. Tricia Miller, head registrar of the museum, will give a tour titled “Cult of the Dead” on Halloween (Wednesday, Oct. 31) at 2 p.m. Miller will discuss how trends in sentimentality and mourning in late-18th- and early-19th-century England influenced similar trends in the United States, permeating much of American material culture from jewelry to schoolgirl needlework to gravestone imagery and cemetery design.